New Melodia pipe in historic style made from 105 year old pine. 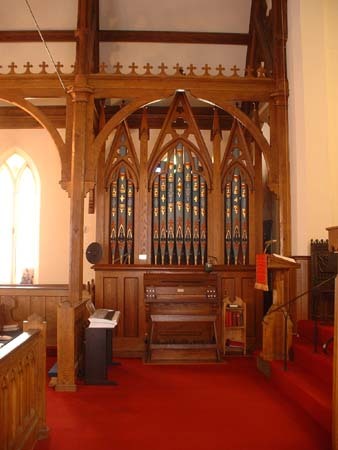 This S. S. Hamill organ was built for St. Luke's Episcopal Church in 1870. It stands in a corner at the left of the chancel, the front facing across the nave of the church. The case, of simple gothic design has three flats of decorated Diapason pipes. The tonal design of the instrument is founded on a style typical of English Chamber Organs. The instrument is almost entirely enclosed with volume regulated by hitch down pedal. Our initial inspection revealed clear evidence that the original voicing was more robust and had greater clarity with tone which would have been more supportive of congregational singing. Like many instruments of the period, the original pitch of the instrument was almost one half step sharp. Attempts to tune the organ down to concert pitch (A=440 Hz.) when combined with the accumulation of dirt and previous mishandling of the pipework left the tone of the instrument generally weak and anemic. 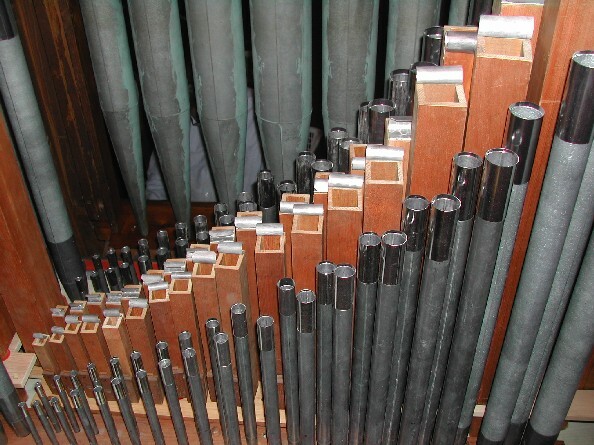 During a previous and ill conceived restoration in the early 1970's the top of the original hand pumped bellows had been removed and replaced with a supply house bellows installed so as to eliminate service access to much of the organ. Fortunately the original feeder bellows and underlying structure was intact. 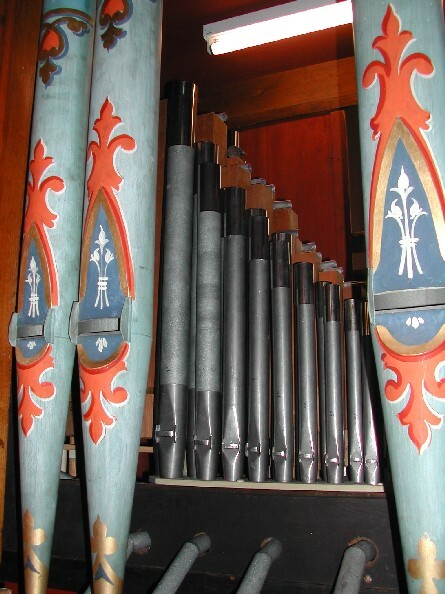 The new bellows was undersized for the organ resulting in unstable wind. A Meidinger blower had also been fitted inside the case without regard for noise from wind turbulence typical of these high speed organ blowers. 1) Properly pitch the organ at A=440 Hz by shifting all pipes up one note and making a new pipe at the bass of each rank. 2) Restore the voicing intended by Hamill so that the instrument could effectively lead singing. 3) Expand the versatility of the instrument by splitting the Open Diapason and the Oboe stop at middle c and adding additional drawstops for their control. 4) Complete a thorough mechanical restoration of the organ. 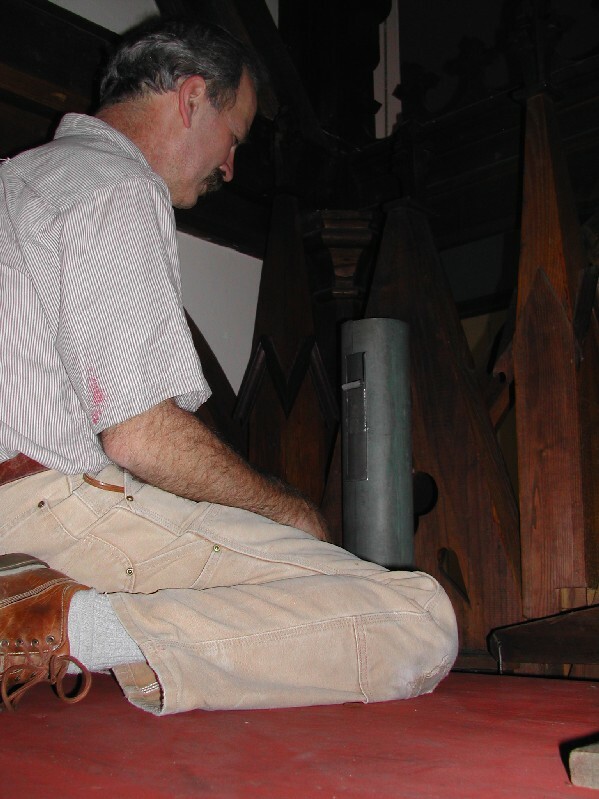 5) Repair the wind system of the organ by building a replica double rise bellows fitted to the original feeders. Preserve the feeders for a subsequent restoration. 6) Silence the Meidinger blower with the installation of silencing baffles in the wind feed. The instrument was removed in June of 2006 and restoration work commenced. As the instrument was dismantled we discovered that several changes had been made to the instrument after it left the Hamill factory, perhaps as early as during its installation or within a few years thereafter. There was irrefutable evidence that the windchest had been altered to extend the compass of several ranks. 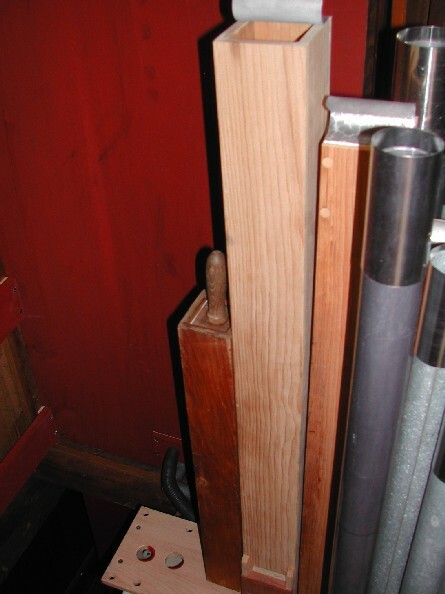 The bass of the Dulciana stop had been drilled and tubed over to the Stopped Diapason Bass so that it would play without the necessity of drawing the Stopped Diapason Bass stop knob. The Chimney Flute and the Oboe where also drilled to extend the compass from the original tenor F configuration down to low C. The added pipework appeared to be from the Hamill workshops but the quality of mitering work on the added Oboe resonators necessary to fit them on the chest was exceedingly poor, suggesting that the work was done on site by the local talent not skilled in pipe making. Reinstallation of the mechanical systems began at the end of August, while the remaining work of refitting the rescaled pipework to the toeboards and restoration of voicing was completed. Within a few weeks most of the organ was complete, with the Oboe to follow in early November following a comprehensive rebuilding and voicing of the stop. The instrument was rededicated on December 2, 2006 with a recital given by Christian Huebner. Original stenciling on facade Diapasons with view to the enclosed pipes behind, swell shades removed. Pipes viewed from rear, swell shades removed. David Gordon on top of the Swell box helping to set the facade pipes.